In renovation of residential buildings, one is often confronted with the need for a lightweight floor that is manually installable, e.g. 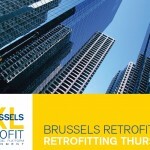 for replacement of wooden floors, addition of storeys, etc. In this project LightComp, we want to explore how combining composites – an emerging construction material – with traditional concrete can answer this need. 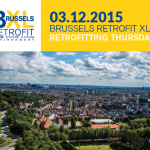 A new composite-concrete floor system is designed, optimised and experimentally validated. 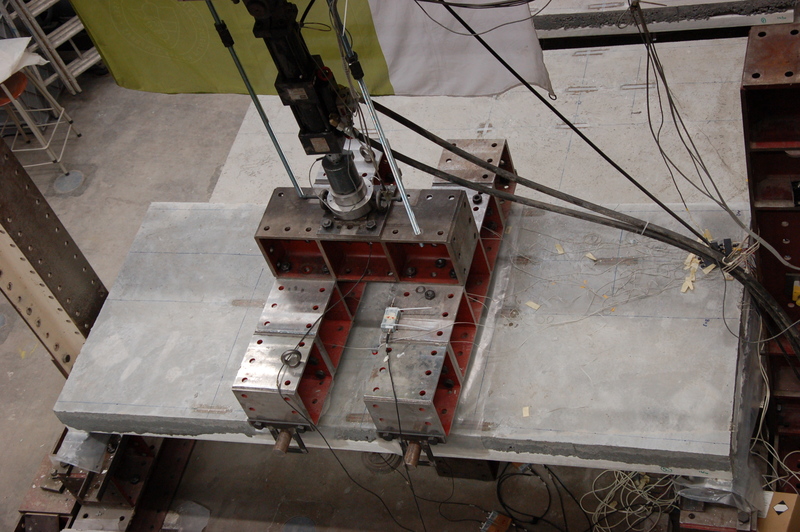 In view of weight minimisation, the following conceptual design was developed (Figure 1): supporting beams – approximate height of 15 cm – consist of a hollow composite box at the bottom to eliminate concrete in tension, and concrete at the top for its compression properties. Between these beams, sandwich panels with a EPS core and composite skins are used. After installing these lightweight elements on site, a concrete compression layer of 5 cm is added to create a monolithic floor system. 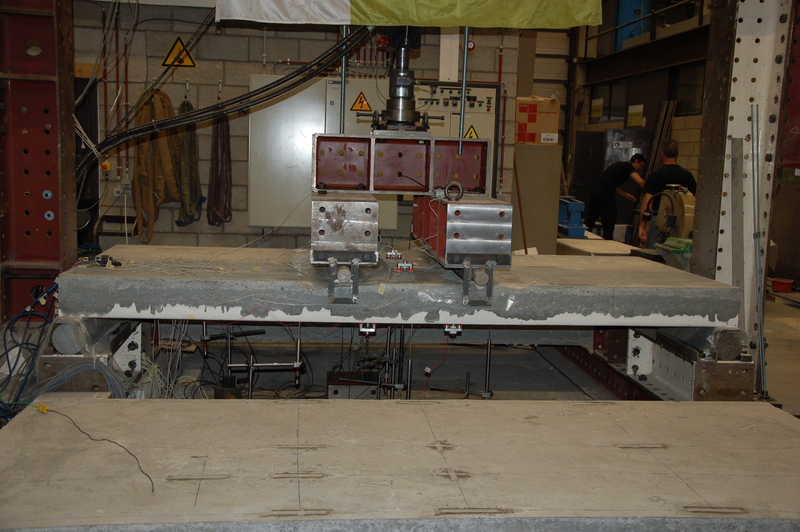 Figure 1: The lightweight hybrid composite-concrete beam-and-block floor. The beams consist of a hollow composite box and a concrete layer on top. 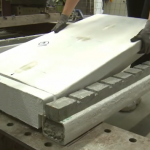 They support sandwich panels with an EPS core and a composite skin. The floor system is finished with a concrete compression layer. 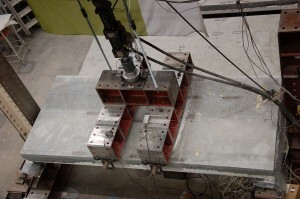 Within the project, an analytical computational model was built to facilitate the structural analysis and design of the new hybrid floor concept. Thereafter, a multi-objective optimisation was coupled to this analytical model to find designs which minimise the weight and cost (Figure 2). Depending on the specific preferences, a structurally sound solution can be chosen: lightweight but with a higher cost or rather economical at the expense of a higher installation weight. 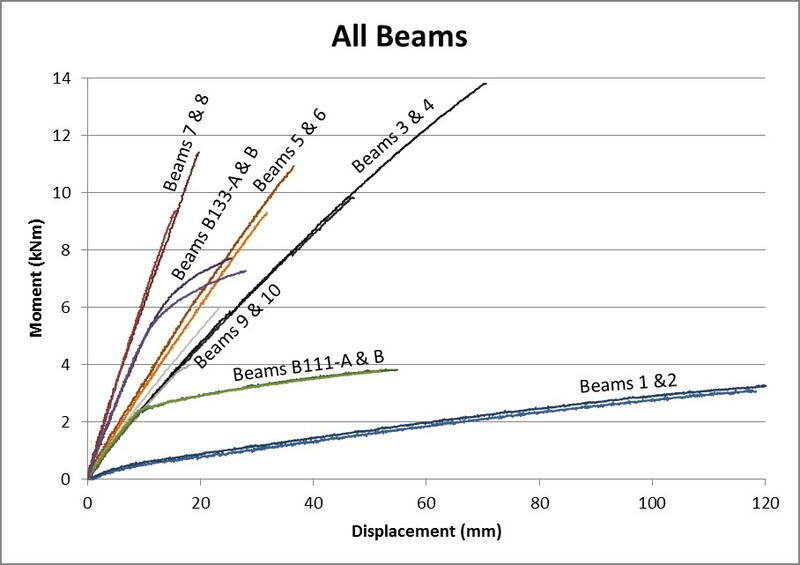 Because the beams are structurally the most important elements of the floor system, experiments on 3 m span beams have been performed (Figure 3). 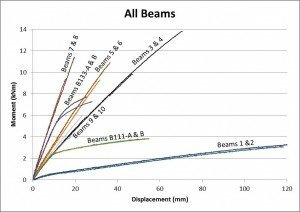 24 hybrid composite – concrete beams have been tested, varying in geometry and composite reinforcement, and compared to 4 reference steel-reinforced concrete beams. 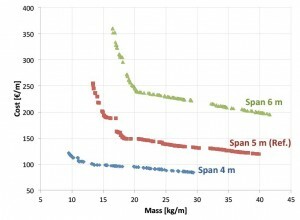 Compared to prestressed steel-reinforced concrete beams (Figure 4: beams B111 and B133), used for a beam- and-block floor with the same span length, hybrid composite-concrete beams (Figure 4: beams 3-10) easily achieve an equivalent stiffness and an increased loadbearing capacity. 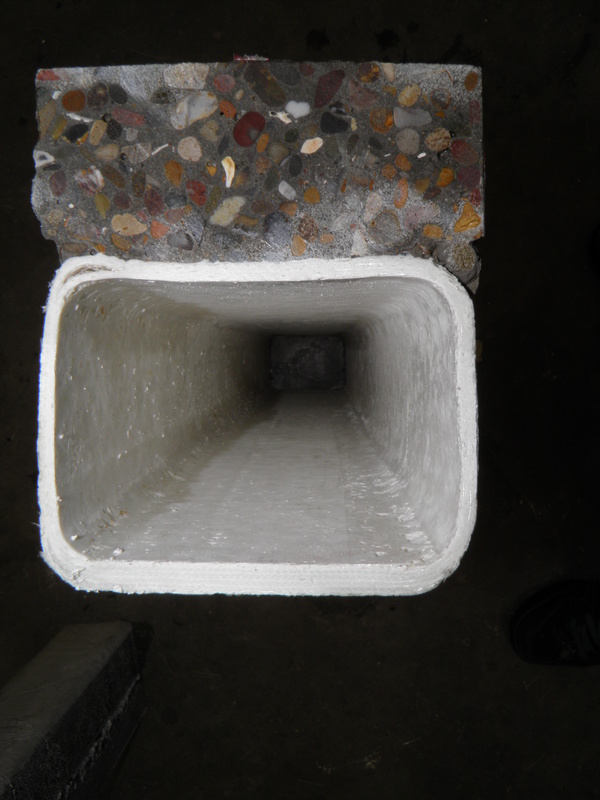 To lower the environmental impact and cost of these hybrid beams, in-depth research is conducted to alternative composite reinforcement for the hollow box, i.e. unidirectional glass- or carbon fibres rather than carbon prepregs. 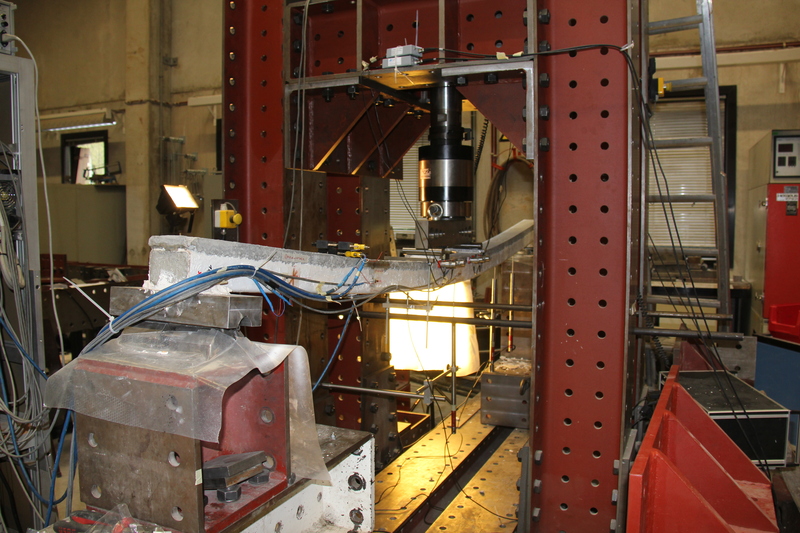 Experimental tests of UD reinforced hybrid beams (Figure 5) show the structural feasibility of this reinforcement. 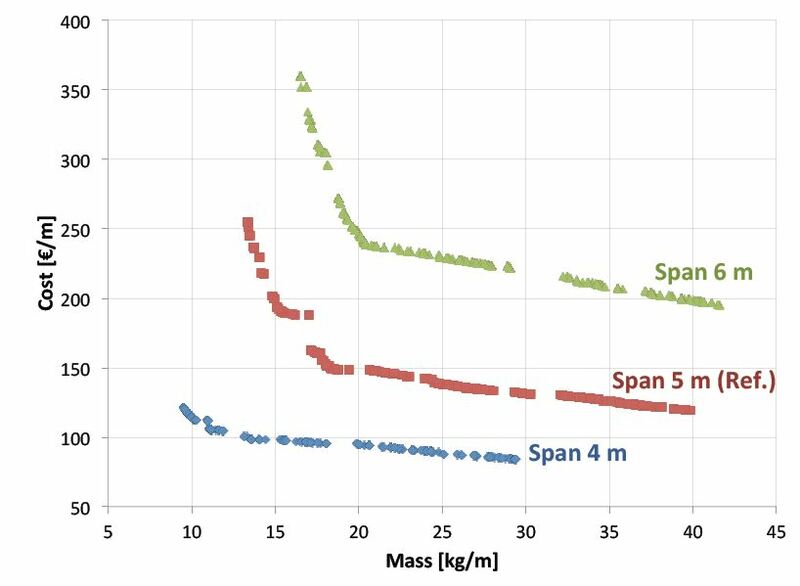 Once the feasibility of the overall floor system was proven by the analytical optimisation model and validated by beam experiments, full floor tests were conducted where floors with a 3 m span and a width of 1.3 m were loaded under four point bending (Figure 6). Two hybrid composite-concrete floors, with the use of unidirectional carbon fibres, were compared to two commercial beam-and-block floors. 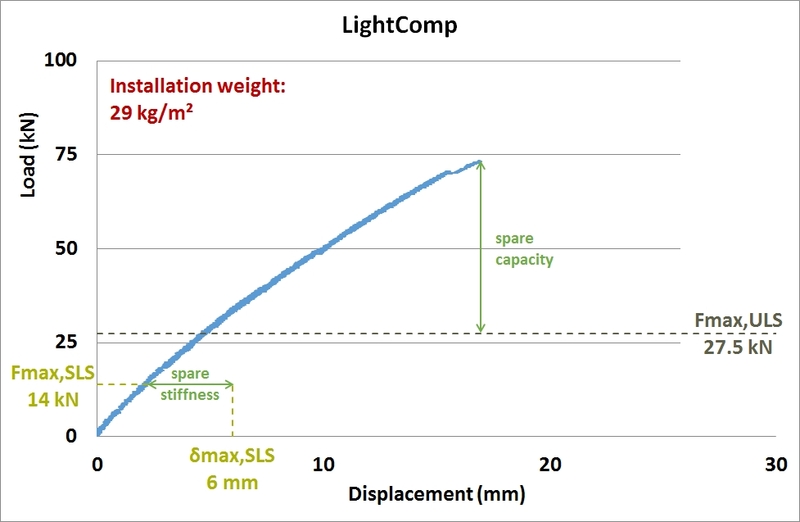 These tests have proven the feasibility of the complete LightComp floor system, considering the exceeding of the required ultimate limit state load and the margin on the serviceability limit state deflection (Figure 7). 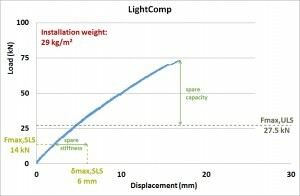 Figure 7: The static load tests prove the feasibility of the LightComp floor system, considering the transcending of the required ultimate limit state load and the margin on the serviceability limit state deflection. 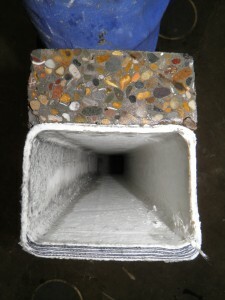 These limit states are met both with the commercial beam-and-block floor as well as with the hybrid composite-concrete floor, yet the latter composite-concrete floor is four times lighter in installation phase. Besides the structural behaviour, a floor system needs to meet other requirements such as the resistance to fire before it can be implemented in residential constructions. Therefore, a fire test was performed at the University of Liège (Figure 8). 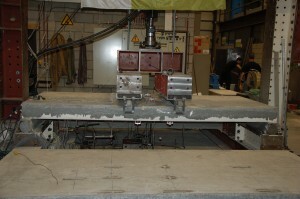 Figure 8: Left: A floor with real-scale dimensions (4.4 m x 2.6 m) is constructed and all finishing layers (gypsum at bottom and acoustic layer + shot creed on top) are added to the structural floor element. Right: A horizontal oven ( at University of Liège) produces the necessary temperature to test the floor. 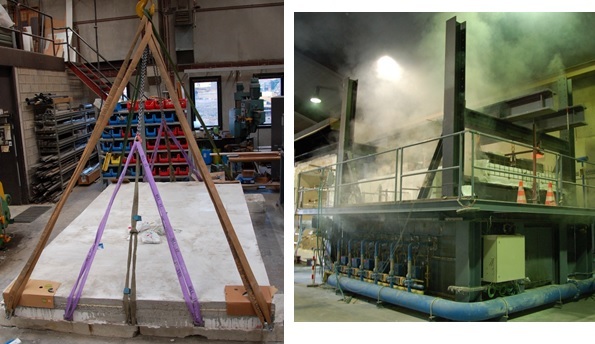 A standardized fire solicitation, reaching over 800 °C after 30 minutes is applied to a fully finished floor system. Failure occurred after 40 minutes and thus before the required one hour resistance. 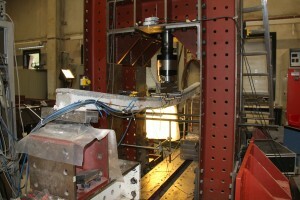 An in depth investigation of the failure mode revealed however that the loadbearing beams have retained their structural function until the end of the test. Failure was induced by the insufficient resistance of the gypsum layer as well as the sandwich panels. Basic fire-specific adaptations on these elements can increase the fire resistance of the whole structure to over one hour. The similarities between floors and balconies and the importance of ‘lightweight’ in renovations for the latter has led to the conceptual structural development of a balcony system (Figure 9). 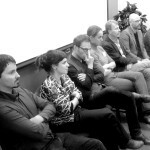 Depending on the proposed cross-sectional design and connection possibilities, a six to fifty times lighter balcony can be obtained than when using traditional steel-reinforced concrete. Figure 9: Lightweight composite balconies are conceptually and structurally developed.